Last summer we were contacted by Charlie Watson, Project Manager at Longhand Isotopes, wanting to use some of our organic vegetables to add to a library of reference samples to authenticate where vegetables come from (vs. where they are declared from) using isotope analysis. Basically, all organic materials, i.e. pertaining to raw vegetable and animal material, can be tested for their geographical origin by means of isotope analyses. This provides a product retraceability independent of any accompanying documentation. Whether the aspargus originally came from Germany or Greece, the steak from Argentina or England or the wood out of Scandinavia or Russia can be determined, simply by testing a small product sample. The basis is a comparison of the isotope value of a well-known geographical location with the isotope value of the sample to be tested for its origin.Isotope analysis can also determine whether a food has been grown using organic or conventional agriculture.We subsequently got the following feedback about a lettuce sample we had provided 'I’ve recently looked at the data from the lettuce sample and it’s, by our standards, one of the most organic lettuces we’ve seen. Neither are radioactive or harmful, nor are either of them produced in an unnatural way. The difference between nitrogen-14 (14N) and nitrogen-15 is not chemical – it’s just that one weighs more than the other. Both originate from the supernova before our sun formed and their abundance in our solar system hasn’t changed significantly in the last 5 billion years. Organic vegetables/crops must be cultivated with organic fertilisers such as composts, green manures, manures or other biomass-based fertilisers. In conventional mineral fertiliser, nitrogen comes from the air and is manufactured into ammonia/ammonium nitrate by the Haber process As a result, mineral fertilisers do not contain as much 15N (heavy nitrogen) as organic fertilisers. 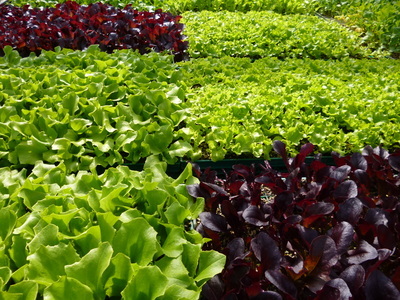 Ripple Farm Organic's organic lettuce The nitrogen ratios (15N/14N) measured from the reference sample provided by Ripple Farm Organics were +15‰. This means that the lettuce was significantly enriched with heavy nitrogen. Normally organic vegetables have nitrogen ratios of +3 to +10‰; it is clear that the reference sample from Ripple Farm Organics was cultivated using very organic fertiliser in order to produce these highly positive nitrogen ratios.